Catalonia's controversial independence poll has prompted a constitutional crisis in Spain. Here are six charts which help to explain what's going on in Catalonia, and why it matters. Catalonia has barely left the headlines over the last few weeks. That's because on 1 October, the regional government held a referendum. 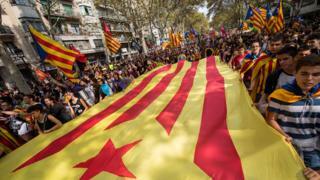 Despite it being ruled illegal by Spain's constitutional court, and despite police attempts to stop it happening, Catalans were asked whether they wanted the region to become independent. 1. How many actually voted? These results were provided by the Catalan government. Although 90% of voters backed independence, only 43% of those eligible cast a ballot. Fewer than half of the electorate actually registered a vote for independence on 1 October. The pro-independence movement draws from Catalonia's strong sense of regional identity - its history, its customs, but also its distinctive language. But how many people in Catalonia speak Catalan every day? About four in ten - but there's large variation depending on where you are. Nearly three-quarters of those in the south-western Terres d'Elbre speak Catalan as their habitual language - but fewer than three in ten do so in Barcelona. Catalonia is a comparatively wealthy corner of north-east Spain. With just 19% of the population, it accounts for more than a quarter of the country's exports. It is also one of the richer parts of the country per capita. Catalonia has the fourth highest GDP per capita in Spain. But its wealth has been a bone of contention. It contributes more in taxes than it receives in public spending. Some say this is unjust - but the Spanish government argues that richer regions should help support poorer ones. It's not just that wealth that Spain would lose if Catalonia broke away. The region exports more than any other in Spain. The Catalan government is keen that, in the event of independence, it maintains ties with the EU - preferably as a member state. It would start life outside the bloc - and Spain would have a veto on its membership. This matters, in part, because two-thirds of Catalan exports go to other EU countries. This is particularly clear when you look at one of Catalonia's most famous exports - sparkling Cava wine. In fact, Catalonia exports more bottles of Cava to the EU than are sold in the whole of Spain. A final cause for concern might be Catalonia's debt. It's the most indebted autonomous region in Spain - and around five euros in every seven are owed to the Spanish government. That could make independence particularly fraught - especially if the Spanish government expected Catalonia to take on a share of the national debt as well as paying what it owes to Madrid.